RandomPottins: "Assassination? That's Our Game!" 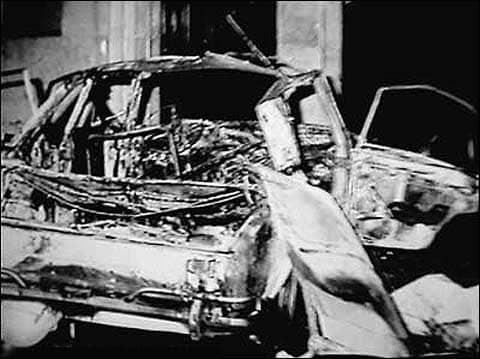 ORLANDO LETELIER and his bombed car. Murdering diplomats in Washington has been done before. AMERICA and Iran appeared a step nearer war yesterday with the US government claiming to have evidence the Iranian government was behind a plot to assassinate the Saudi ambassador in Washington. Describing a "murder-for-hire" plot involving two Iranians and a Mexican drugs cartel, US attorney-general Eric Holder said the Saudi ambassador and scores of others would have been killed in a bombing at a Washington restaurant. The attorney-general said Iran would be "held to account" over what he described as a flagrant abuse of international law. Tne US Treasury department immediately imposed sanctions against five individuals allegedly linked to the plot. The Iranian government said it was "outraged" over the allegations, and that the US was expert at making false claims. "This is a fabrication," said a spokesman for Iranian president, Mahmoud Ahmadinejad. The bomb plot accusation comes as Saudi forces have been putting down demonstrations for civil rights in their eastern provinces, and blaming the unrest on encouragement from Iran. In neighbouring Bahrain, following the suppression of democratic opposition with the help of Saudi tanks, the authorities have sentenced doctors to long terms in prison for treating injured protesters. In the United States itself the Obama adminsitration is seeing the streets and headlines taken from the right-wing "Tea Party" by an unprecedentedly wide movement across the country supporting the populist and anti-capitalist call to "Occupy Wall Street" and end the bankers' power. Meanwhile in Israel, amid relief that the Netanyahu government had finally negotiated the release of captured soldier Gilad Shalit in return for Palestinian prisoners, after years when it preferred making war, there were suggestions from seasoned critics that Netanyahu was clearing the decks for the big one - preparing for war with Iran. It has been said before that Israel would need permission for its planes to cross Saudi airspace for this, and though there were reports this had been obtained, the Saudi regime might find it easier if they had a pretext. The basis for the Iranian bomb plot story is that two men, one an an American-Iranian, Manssor Arbabsiar, 56, and Gholam Shakuri, an Iranian, have been charged in New York with the alleged plot to pay a Mexican drug cartel to help assassinate Adel al-Jubeir, the Saudi ambassador and close confidante of the Saudi king. According to the US justice department, the aim was to bomb a restaurant in Washington frequented by Jubeir with the possibility of a hundred or more bystanders being killed in the explosion. US officials said the Iranians put a $1.5m price tag on the assassination. The White House said Obama called Jubeir today to express solidarity between the US and Saudi Arabia in the face of "a flagrant violation of US and international law". Meanwhile US officials said the bomb plot could have been written as a Hollywood script. As with previous US accusations linking the Tehran government to bombings in Argentina, the precise motivation of the alleged conspracy has not yet been made clear. It is true that the Iranian and Saudi regimes, one Shi'ite and the other Sunni, are rivals, waging a stealthy war by proxy for supremacy in the Muslim world, and particularly via the upeavals in the Middle East. It is also true that the Iranian regime has engaged in terror against its political opponents. Iranian and Kurdish exiles abroad, - and got away with it - before. Whatever the truth about the present story, however. for America to get on its high horse and display moral outrage over an assassination plot will cause wry amusement to anyone who knows the global record of the CIA. The US government and its agencies have also not been too concerned about killing innocent bystanders in the bombings they have carried out or supported - including some in Iran. As for the killing of a diplomat in Washington, the alleged plot against the Saudi ambassador would not be the first time something like this was done. Last month saw the 35th anniversary of one such murder, that of former Chilean ambassador Orlando Letelier. Letelier, a Chilean Socialist and oppoment of the right-wing dictator General Augusto Pinochet was killed by a car bomb explosion on September 21, 1976, in Sheridan Circle, along with his US assistant, Ronni Moffitt. Her husband Michael Moffitt was injured but survived. Several people were later convicted for this murder. Among them was a former CIA man Michael Townley, who served five years in prison but was freed under the Federal Witness Protection Program. General Manuel Contreras and Brigadier Pedro Espinoza of the Chilean DINA secret police were convicted in Chile in 1993. Townley said that General Pinochet gave the order for the attack; This was confirmed by General Contreras. But Pinochet, who died on December 10, 2006, was never brought to trial for the murders. Following Pinochet's death the Institute for Policy Studies (IPS), for which both Letelier and Moffitt worked, called for the release of all the classified documents related to the Letelier–Moffitt assassination. The Clinton administration de-classified more than 16,000 documents related to Chile, but withheld documents related to the Letelier-Moffitt assassination in Washington on the grounds that they were associated with an ongoing investigation. If there was an investigation, the Bush administration cancelled it. A State Department document made available by the National Security Archive on 10 April 2010 reveals that an official statement warning against Pinochet's Operation Condor assassination program was sent to US diplomatic missions in Chile, Argentina and Uruguay on 23 August 1976, to be passed on to the host governments. But this was rescinded by Secretary of State Henry Kissinger on 16 September 1976, supposedly after US ambassadors raised fears for their safety and the diplomatic consequences. Five days later the assassination of Letelier took place in Washington. The US administration is plainly not as concerned about offending Ahmadinejad as it was about upsetting the CIA protege Pinochet. For his part, Ahmadinejad, faced with continued political and social unrest at home, has been happy to play the bogeyman for Western imperialists, and democrats, so he can rely on tension and threats coming from abroad. But this time the game may be getting out of his hands. Unlike the days when it placated Pinochet, the US is calling on its allies to help isolate Iran. This might be a substitute for waging war, as we are told, or it might be a preparation for it.